strong frames are essential for safe to use trampolines. Strong frames do not only prevent trampoline frames from getting damaged, but also prevent the springs from detaching from the frame. key factors of springs are the spring length and stretch. These must be matched with the trampolines requirements. Independent research has shown that from a safety perspective the G stress delivered on the back and neck when bouncing on a trampoline is less, if the trampoline’s springs allow a progressive stretch. Progressive stretching of trampoline springs enable a deeper, softer, and more controlled jump. common mats are woven string mats as used by professionals, and the lower priced black tarp mats. Black tarp mats often compress the air and therefor lower the bounce. woven mats allow the air to pass freely through the mat, causing less energy wastage and a higher jump. All products are custom made according to the customer’s requirement. Please give us clear specifications on your required products. G.F.F. is part of the world's most reknown network of star fitness manufacturers. Together with our strong network of partner factories, we produce over 60% of the world's exercise and gym balls. Factories can generally only produce a handfull of products, this is why the factory of the future is connected to all other factories of the same product segment. To offer all of the world's best fitness products to our customers we have built a network of the world's leading fitness factories. Strong product knowledge, long partnerships with most other factories of the fitness segment, skilled outsourcing and pooling of specific tasks, as well as further combinations of working with a global network of fitness factory partners allow us to supply our customers' with the world's best fitness equipment, with the newest technologies, and everything at the market's lowest price. This makes G.F.F. the global one stop production platform within the fitness segment. 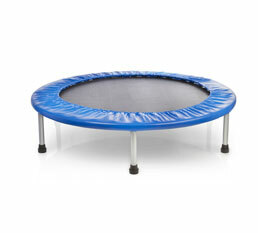 Mini fitness trampolines are made of a metal frame, strong metal springs, and a PP mat. The springs are covered by a padded PVC fabric. Common sizes are 32", 36", 38", 40", 45", 48", 50", 54", and 60". 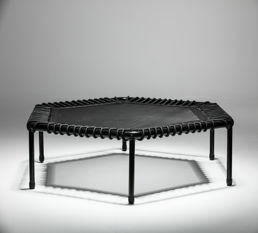 The trampoline mat is commonly made of heavy PP. Some fitness trampolines have handle bars for easier balance and coordination.